Welcome to what is most likely heaven on Earth for Nordic fauna fanatics! The Alaska Rainforest Sanctuary is a 40-acre rainforest consisting of immense spruce, hemlock and cedar trees with a forest floor covered with several different kinds of moss, wild flowers and berries. A living postcard of the Alaskan wildlife, the sanctuary is located just a few miles outside the picturesque and tranquil fishing community of Herring Cove. The sanctuary is not just about breathtaking sights but also memorable and varied experiences led by naturalists, that truly reflect what life is like in this harsh but fascinating and pristine climate. 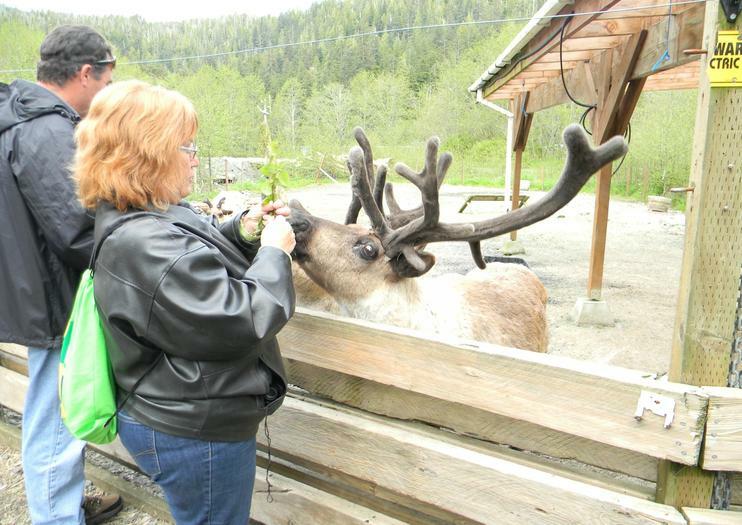 Here, visitors can interact with a herd of Alaskan Reindeer, marvel at Eagle Creek (Alaska’s richest salmon spawning stream), step back in time while visiting a historic Alaska sawmill, learn more about the local fauna at the Alaska Wildlife Foundation Center and even watch a Native master totem-pole carver at work. The Sanctuary is also home to a variety of species that are not quite as friendly as reindeers – such as Sitka black tail deer, mink and marten, bald eagles, black bears, seals and many types of birds – making the excitement all that more palpable. Not to mention the photo opportunities! The Alaska Rainforest Sanctuary is located in Ketchikan on Revillagigedo Island in the Alexander Archipelago of southern Southeast Alaska. There are ferry services from Juneau, Hollis and Wrangell to Ketchikan, as well as an international airport on neighboring Gravina Island. Touring the Alaska Rainforest Sanctuary costs $89 per adult and $50 for those under 12 years of age. Experience the wilderness of Southeast Alaska in an exciting way! You'll be exploring the remote back country of the Tongass National Forest along several miles of improved forest trail. A comfortable pace is maintained as you thread your way through ten miles of mountainous roads, around steep curves, on the climb to awe inspiring views. Explore the dramatic wilderness of the Alaska Rainforest Sanctuary on this 2.5-hour small-group walking tour. Learn about the local ecosystem and the wildlife it supports from a knowledgeable and friendly guide. Walk through a beautiful mountain forest, home to bears, bald eagles and deer. Learn about the dynamic nature and abundant wildlife of a scenic marine estuary. You’ll have plenty of great photo opportunities and to learn about totem pole carving at a historic sawmill. If you’re thinking, “Zipline tour? Been there, done that,” maybe you just need to up the ante. This thrilling zipline tour in Tongass National Forest will have you flying through an Alaskan rainforest canopy at heights up to 135 feet (41 meters) above ground. Across 6,000 feet (1,830 meters) of dual-line cables and three hanging bridges, you’ll have unique vantage points to look for bears feeding on salmon and watch bald eagles soar through the sky. This exciting experience from Ketchikan is limited to nine people per group so you can enjoy personalized attention from your guides.